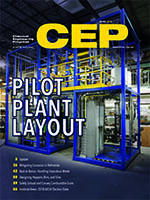 Learn how to better estimate the space requirements for a pilot plant to ensure adequate space is allocated. Other topics in this issue include mitigating corrosion in refineries; handling hazardous waste; designing hoppers, bins, and silos; safely unloading and conveying combustible dusts. Follow these recommendations to ensure your pilot plant has sufficient space to achieve your research and development goals. As opportunity crude usage increases, unexpected corrosion has become a major issue in piping and process units. Corrosion monitoring is a crucial part of maintaining the operational integrity of a refinery. Hazardous-waste disposal presents unique challenges. An analysis of several incidents highlights the importance of properly characterizing waste prior to processing. Follow a guided approach to measure solids properties, choose bin shapes, and calculate hopper angles and outlet sizes for effective storage and use. Dust explosions are a major hazard of unloading and conveying operations. Protect your facility from explosions with venting panels, flameless venting systems, and chemical suppression systems.